Taking a group trip in New York? Easy Charter Bus is here to make your travel plans simpler with reliable charter bus rentals throughout the state. Whether you're traveling within NYC's city limits or across the country, our team is dedicated to helping you find the right bus with the right accommodations for every wedding, corporate event, sports outing, field trip, and more. 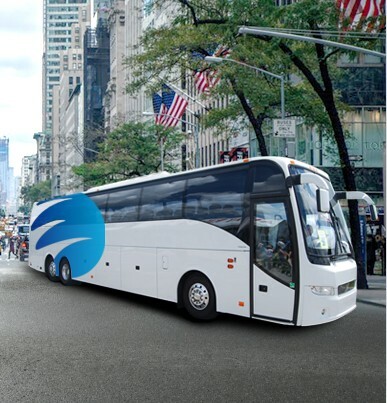 Master group transportation in the Big Apple with Easy Charter Bus. We work with you to find the most dependable, modern buses fit to your group or event. Whether you’re going to a corporate event or touring New York City with a group of friends, we’ll be there to make the process easier than ever. Take a guided tour of the Statue of Liberty National Monument, inspiring travelers immigrating to the U.S. since it was first built in 1924. The building was a gift from the people of France and was designed for the purpose of honoring the United States’ centennial of independence and the country’s longstanding friendship with France. The statue was built by the Frenchman Frederic Auguste Bartholdi. Enjoy a relaxing stroll through Central Park, an attraction located in the middle of Manhattan that has become a hub of New York City where you can dine, shop, and admire the busiest part of the city. This natural landmark also provides a lush environment for recreational sporting events such as mini sailboat racing, jogging, biking, and events by the lake. The park also hosts live concerts, art and wine festivals, and farmer’s markets. Discover New York’s most popular observation deck, standing at a total of 1,454 feet. The Empire State Building stood as the world’s tallest building for nearly 40 years. Explore the biggest shopping hub in the world, which has become one of New York’s most modern attractions as it is home to some of the largest stores in the world. Shop through the famed shopping district including crowd favorites: H&M, Nike, or SaksFifth, MAC, and Footlocker. Stop by the largest art museum in the country and the fifth most-visited museum in the world. Uncover the Met for an upscale art gallery offering modern and contemporary historic galleries. Travel to the spectacular Brooklyn Bridge to witness a symbol of victory for New York and Brooklyn. The Brooklyn Bridge was originally opened in 1883 over the East River to connect the great cities of New York and Brooklyn for the first time in history. Tour the iconic Rockefeller Center located in the breathtaking center of Midtown Manhattan, showcasing the liveliness of Fifth Avenue between 48th and 51st Street. Commissioned by the Rockefeller family, the attraction provides a historic landmark for tourists to shop, dine, and explore the best of New York. Adventure to New York’s premier transportation attraction, which offers shopping, dining, and endless transportation access to any destination in New York. The historic world-famous landmark in Midtown Manhattan provides 60 shops, 35 places to eat, and a full calendar of events to entertain in the city. Admire the best of Midtown West in the Theatre District. This unique attraction showcases Broadway, costumed characters, and plazas of Times Square. On the popular 42nd Street, you will find New York City’s best of the best in plays, musicals, and revivals set in a spectacular location in the city. Witness your favorite plays from Chicago, King Kong, to Frozen. Relax on Coney Island, a residential Brooklyn neighborhood that transforms into a relaxing entertainment destination each summer. This attraction draws in locals and tourists to its beach, the Wonder Wheel, and Lunar Park, an exciting amusement park featuring the Cyclone. Call us today at 718-502-9983 with the number of passengers in your group, your trip dates, and pick up and drop-off addresses. Our skilled reservation agents will assist you in finding the perfect bus for every occasion, and you'll promptly receive a quote for your upcoming trip. There's no obligation to book, but we're confident you'll like what you see. 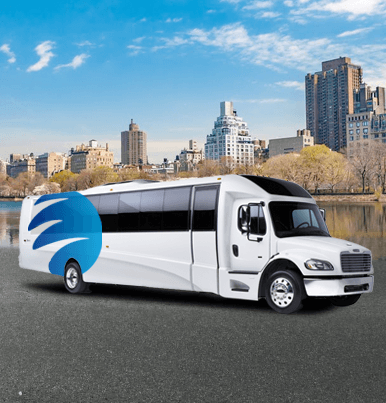 We have one of the largest selections of charter buses in NYC, and with so many coaches and amenity options to choose from, we know you'll be satisfied with your experience at Easy Charter Bus! Don’t let the logistics of team transportation get in the way of victory. 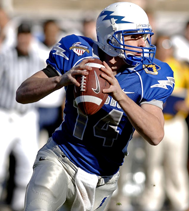 Easy Charter Bus works with coaches, athletes, and dedicated fans of all kinds to get them to their next game or sporting event with ease. Relax and focus on the game as your ride in comfort with amenities like reclining seats, flat-screen TVs, restrooms, and more. Savor every moment of your big day without a single worry of transportation. From the engagement party and the bachelor or bachelorette to the moment you say “I do,” Easy Charter Bus will be there to make sure everything runs smoothly. Ride with your wedding party in style and shuttle guests to your venue with ease for an unforgettable event. Wow clients and ensure every employee is accounted for with a professional charter bus rental. Corporate conferences, trade shows, offsite meetings, company retreats, and more are handled with the utmost professionalism when you work with Easy Charter Bus. We’ll find you a bus rental equipped with WiFi, power outlets, and more so employees can work while on the road. Enrich your students’ minds without the hassles of organizing transportation on your own. When you upgrade from an old, traditional school bus, your group can enjoy the comfort of reclining seats, TVs with DVD players, on-board restrooms, and more for the best trip of the year. Easy Charter Bus always prioritizes safety and only works with certified, licensed drivers. Charter buses offer the most space and freedom when it comes to transporting groups of people. 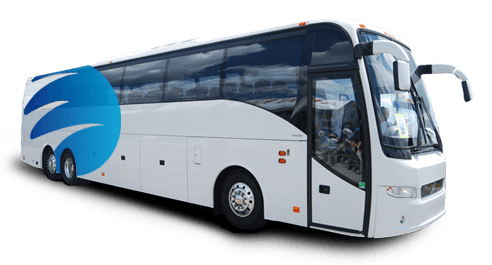 With the ability to hold up to 56 passengers, charter buses are ideal for long-distance trips and can come with premium features like extra legroom, on-board restrooms, luggage storage, and so much more. Minibuses are more compact and come in a variety of sizes, from 18-passengers to 25-passengers, making them easy to tailor to your group. Minibuses are perfect for shuttling passengers throughout NYC and other short-distance trips. They can also come with a variety of luxury amenities, like flat-screen TVs, an AM/FM radio, a PA system, and more.